The polar bear just can't seem to lose its headline-grabbing 'poster child' image - this week the Incredible Shrinking Polar Bear was added to the portfolio alongside Drowning Polar Bear, and Bear Stranded on the Ice Floe. That's thanks to the publication of new research that showed that this mighty hunter of the north was on the road to being downsized - because of global warming. Of course, it's not just polar bears that are losing the pounds. Sheep, deer, toads and tortoises are all trimming down, with cold-blooded animals leading the rush. But the polar bear is the one that captures the imagination - most probably because of the absurdity of this behemoth of a bear being on the slippery road to becoming a size zero. The revelation also fits neatly into the wider story of the Arctic ice-cap; it too has seen its domain shrivel, to the lowest size on record this summer. It seems cruelly apt that prince of the Arctic, the polar bear, is having to cut its cloth tighter to match this diminishing realm. Stranded on ice an occupational hazard - The role of polar bear, in the global warming story, is not an uncontroversial one, however. Pictures of stranded polar bears perched on crumbling ice floes, seemingly all-at-sea in the face of global warming, inevitably grab the attention. But in truth, hopping between the fragmented floes of the far north has been an occupational hazard for polar bears for millenia. 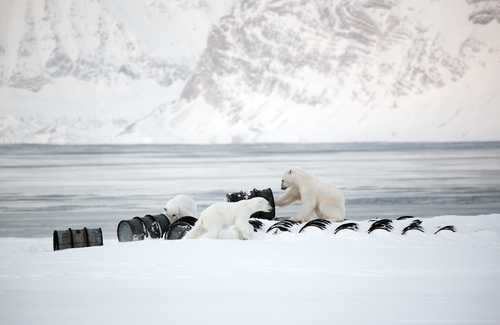 Behind the pictures of sea-stranded bears, though, is a subtler threat. Polar bears flip between the northern shores of Canada in the summer, and the ice-floes of the Arctic's ice cap, in regular annual see-saw movement. But during the colder months is when their menu is richest - when the floes become the launching pad for hunting down their favored prey - seals. The problem is that the sea-ice is further away from the land for longer now, as the ice-cap shrinks, so reducing the seal-hunting season. That has led many scientists to become worried about the possibility that Arctic ice-loss would severely reduce polar bear numbers. The threat seemed to be made harrowingly real a few years back, with the discovery by a pair of scientists, Charles Monnett and Charles Gleason, of numbers of drowned polar bears cubs. Their paper made a direct link between these polar bear deaths, and retreating sea-ice, cementing the idea of the polar bear being under the ax of climate change. Witch-hunt in the offing? - Earlier this year, however, that specific report was cast into doubt. Monnett was suspended, and now Gleason is being investigated too, by agents from the US Office of the Inspector General. The allegations are hazy, but seem to relate to scientific misconduct over some aspects of the report of the drowned cubs. While some see this an example of scientists as over-reaching themselves, to make the case for action over global warming, others see the start of a witch-hunt. Whatever the details of the case, it does raise an awkward question - by elevating the polar bear to an icon of the perils of climate change, is the environmental movement leaving itself open to an all-too-easy backlash? Has the image of polar bear become a hot potato that is becoming increasingly uncomfortable too handle? Those questions are coming to head this week with a ruling over a suit bought by Greenpeace, Defenders of Wildlife and other environmental groups, against the US government. Polar bear in the dock - The polar bear was put on the official endangered species list by the US government back in 2008, after a previous successful court action. Under the Endangered Species Act (ESA), the US government had to do all it can to protect what was widely agreed to be an endangered species. And that should include more drastic action to curb greenhouse gas emissions, claimed the environmental groups that bought the case. After all, the threat from global warming is what got the bear onto the ESA list in the first place. But the federal judge seems to have passed on this particular political hot potato. In a ruling on Monday, Emmet G. Sullivan dodged the question of using the ESA to push through limits to greenhouse gases, or halting Arctic oil and gas exploration. The court wasn't the right venue for such a debate, he decided. He did, however, order an environmental impact statement be undertaken - one which could yet open the door to the need for action over greenhouse gases, to save the bear. 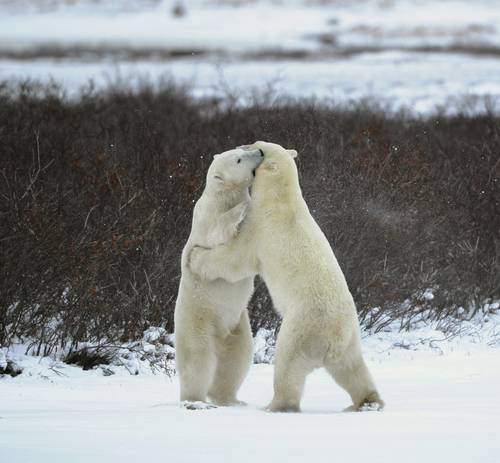 So it seems much is at stake over the role of climate change in the future of the polar bear. Whole industries are threatened, and economies will need to be shifted, if the claims that climate change is a real threat to the bear hold water. Which brings us back, first, to that federal investigation into the scientists and those drowned polar bear cubs. Is it really a coincidence that such strong pressure is being applied to these scientists, in the months leading up to this critical polar bear ruling? And secondly, it what of the role of the polar bear as a poster child for climate change? A single striking image grabs the attention in a way that a thousand dry words often fail to. Polar Bear Under Threat is a picture that has undoubtedly galvanized millions into taking action over climate change. But action through icons leaves those icons vulnerable to attack. Let's hope that the survival of the polar bear doesn't become another hot potato that is tossed into the long grass - after burning one-too many fingers.